Struggling military veterans will have access to new housing and resources to help end the cycle of homelessness, as construction is now underway for a new, affordable-housing community in Minneapolis. Veterans, project partners and community leaders herald the start of construction for Veterans East during a groundbreaking ceremony at the construction site. L to R: Andrew Johnson, Minneapolis City Council Member; Peter McLaughlin, Hennepin County Commissioner; Elizabeth Niemyer, Rear Admiral US Navy (Retired), Chief Program Officer, UnitedHealthcare Military & Veterans; Mary Tingerthal, Commissioner, Minnesota Housing; Elizabeth Flannery, CEO, Community Housing Development Corporation; Patrick Kelly, Capt. US Navy (Retired); Director, Minneapolis VA Health System; Warren Hanson, President and CEO of Minnesota Equity Fund; Chris Laurent, Senior Vice President, Cinnaire; Tim Moore, veteran and resident of Veterans Housing Community; Dale Forsberg, president, Watson-Forsberg General Contractors (Photo: Matt Page). 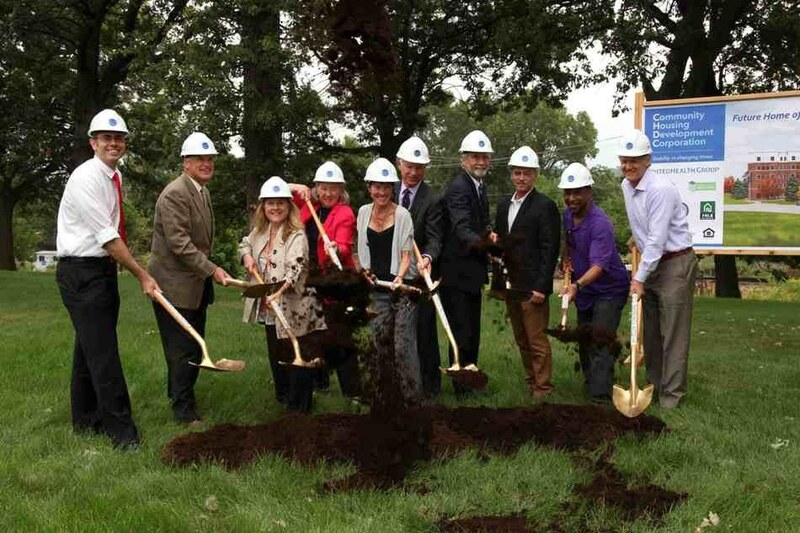 During a ceremonial groundbreaking for Veterans East, veterans groups, project partners and community leaders heralded the new development as vital in helping end homelessness among military veterans in Minnesota. According to Heading Home Minnesota, a public-private partnership to end homelessness, more than 10,000 Minnesotans are homeless on any given night, including more than 279 veterans. Funding for the $14.3 million veterans’ community, developed by the Community Housing Development Corporation (CHDC), was secured through a collaboration of public- and private-sector partners. Minnetonka-based UnitedHealth Group (NYSE: UNH) is the largest private investor, providing $5.2 million in equity through a partnership with Minnesota Equity Fund, using Low Income Housing Tax Credits approved by the state. Minnesota Housing, the other major investor, is providing $7.7 million in deferred loan funds for the new development. Additional funding includes $500,000 from Federal Home Loan Bank (FHLB) of Des Moines; $350,000 from Hennepin County; $260,000 from CHDC affiliates; and $290,000 in energy and sales tax rebates. When completed in Summer 2017, the new 100-unit efficiency apartment community will provide permanent supportive housing for veterans struggling with homelessness. Through partnerships with the Veterans Administration, CHDC, BDC Management Company and Hennepin County, Veterans East will include onsite services to assist residents with health care, case management, life skills, financial management, benefits assistance, education and employment resources. The five-story property will feature a lobby with security, community room with gas fireplace and kitchenette, laundry facility and resident parking. Watson-Forsberg is the general contractor, and LHB is the architect. The $5.2 million investment by UnitedHealth Group is part of more than $240 million the company has provided since 2011 to finance affordable-housing communities with supportive services throughout the United States. These investments have included $29 million for affordable housing in Minnesota, including $7.2 million for the recently completed CommonBond Veterans Community at Fort Snelling.